Salisbury Prison was the only Confederate Prison located in North Carolina. Located in Salisbury, on 16 acres purchased by the Confederate Government November 2, 1861, the prison consisted of an old cotton factory building measuring 90 x 50 feet, six brick tenements, a large house, a smith shop and a few other small buildings. Many Union soldiers were captured at the first battle of Bull Run at Manassas. It was these soldiers who became the first prisoners at Salisbury. Southern political prisoners, along with deserters from both sides joined the swelling ranks of prisoners inside the walls of Salisbury Civil War Prison. The very first POW of the war was held in Salisbury Prison and when first established, life was rough, but prisoners had a large yard with plenty of room to move about. One of the favorite activities before the prison became overcrowded was baseball. 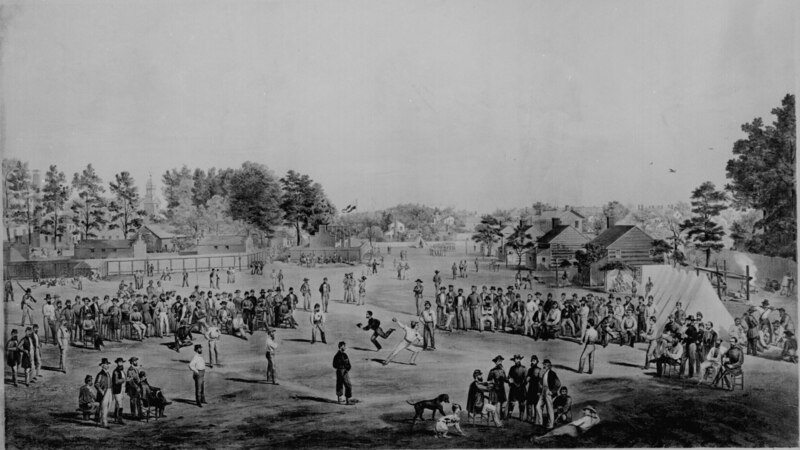 Photo of a baseball game played by Salisbury prisoners from NARA. Supplies and rations for the prisoners were meager but enough to live on. Due to the exchange and parole of so many prisoners, overcrowding was not an issue until late in the war. Paroles and prisoner exchanges came almost to a complete halt and Salisbury Prison became extremely overcrowded. Rations and supplies were depleted. Conditions worsened, disease and fever ran rampant and spread easily among the prisoners who had become weakened due to malnutrition. Many prisoners suffered and died. They were buried in trenches (mass graves) outside the prison walls. This area outside the prison is today known as Salisbury National Cemetery. Visitors to Salisbury National Cemetery can overlook this place and a sense of great sadness and loss will overtake them. I visited there a few years ago and have to say I came away with a very heavy heart. Salisbury prisoners are buried in 18 trenches which are 240 feet long. Today, there are thousands of grave markers lined up row after row. The Prison itself is long gone but anyone who looks out across this vast sea of graves, will have a haunting memory etched in their mind forever and Salisbury Prison will not be forgotten. Confederate Soldiers Buried in Rowan County, NC.